Native Pimelea Plant grown in Melbourne. Melbourne has access to a range of Online and Retail Native Plant Nursery. A specialist native plant nursery can supply a wide range of Australian Native Plants for Melbourne and Victoria. We bring you the best native plant nurseries for Melbourne. We include some of the best community nurseries specialising in local native plants. Nurseries such as Karwarra Australian Plant Garden which has a wonderful display garden and small attached sales area. Nurseries such as Vaughans Native Plants are located in the Grampians at Pomonal and they provide the best range of grafted Australian Native Plants that we have seen. 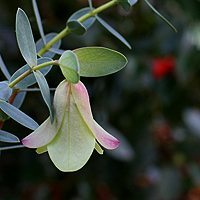 Looking for a specialist Australian Native trees grower, Tall Trees and Blerick Tree Farm provide a huge range..
Fern Acres at Kinglake offers a variety of Australian Native Orchids, Dendrobium/Dockrillia & Sarcochilus species plus Ferns. AllansForest has a huge range of Australian Native Tubestock plants for revegetation projects. 17 Greenwood Avenue Ringwood, VIC 3134. Native garden with small nursery attached. Austplant have plants and designs to suit all locations around Melbourne, with over 600 varieties, from Grasses to Gum trees, the friendly staff at Austplant will find the right plants to suit your garden. Wattle Nursery. Specialising in beautiful, rare and endangered species of Acacia. Visit the Wattle Display garden by appointment. All modern Acacia cultivars for sale/order.